Hey guys!! We made it to Friday! 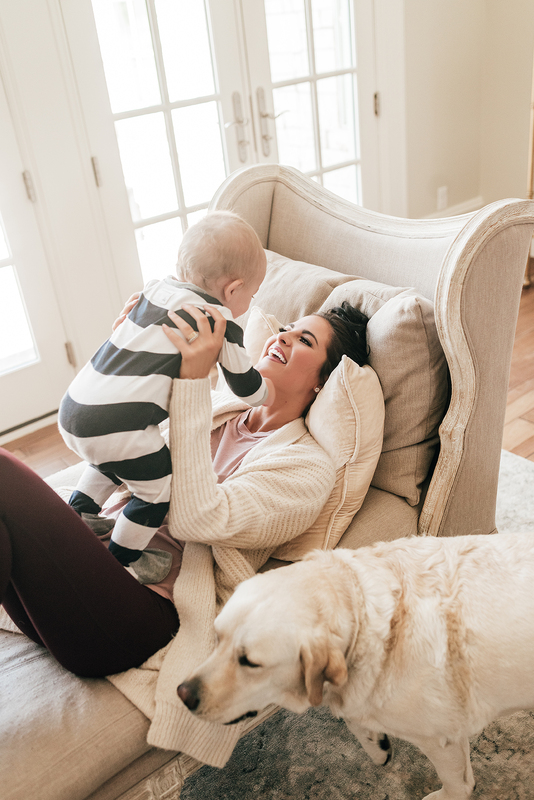 This is what my favorite days look like… being at home playing with my babies. And the best part is my entire outfit is ON SALE from Nordstrom!! These leggings are so comfy and this shirt and cardigan are both amazing (last worn together in this post). Do you have any fun plans for the weekend?! I love the colors of those leggings!! They look super comfortable too! These photos of you and the kids are so cute! You have such a cute home interior! I love this outfit – so cute and comfy! I wish that cardigan was still in stock. The color you chose is perfect! Such a cute outfit! Your sweater looks so comfortable! I have yet to wear Zella leggings but would love to know how they are with a workout? Do they stay up well? Love the color of them. Zella leggings are the absolute best! I stocked up while they were on sale! I love that cardi! I hope it gets restocked because it’s such a cozy looking piece for fall and winter! I also love those leggings, too! Thanks for shadjbf, girlie, and I hope you have a great weekend! This makes me really wish I was cozy at home and not at the office haha! I love this look! Oh yes, cozy and comfy moments at home are the best! :) Lovely photos! Love this cozy look! I think I may need this sweater. Also, your kids are too cute. I seriously love the burgundy leggings! That outfit looks so cozy, I love wearing stuff like that when the weather cools down in the midwest. Pretty! Love this color scheme. Perfect for fall days at home! Such a cute look!! Loving that cardigan! This look is so cute & looks so comfy! Your babies are soo adorable! Love this look for home! The colors are perfect! That sweater looks so cozy. Your kiddos are adorable. You and your babes could not be any cuter!!! These leggings are my fav!! Your home is so bright and clean, I love it! You have such a sweet looking family! Love this!! What color lipstick are you wearing? Your house is so pretty, especially the fireplace and I loved your photos from the pop up today, I can’t wait to see more! Nice outfit. It looks very comfortable and cozy. I’ve been a big fan of yours for years but am not sure if I’ve ever commented before. I’m a blogger too, but for interior design– 98%. Love your home and you look awesome in the clothes! Your kids and doggy are so, so cute. My favorite pic is of you and the baby on the chaise. But had to laugh, because both of my sons, now 27 and 22 bathed me in baby barf and everything within three feet of their sweet little mouths until they were seven months. And then, like a faucet, one day it got turned off. Where did you get that gorgeous off white basket in the background? Could you do a home tour or room tours? I’m moving into a 3 bedroom home with great living room space from a 1 bedroom apartment! I am lost!! This looks super comfy and cozy! What Ct are these diamonds that you have In? I love your fireplace! I would love to know the material that it is made of! Thanks so much!